Episode 1: Little Things -- More than anything else, Cherub wishes to share Heaven with children everywhere! What a surprise when Jesus commissions him to do so, resulting in a fun-packed visual delight of a program! From visualized prayers to captivating songs, "Little Things" teaches children that even the little things we do for God can have big effects! Fullscreen. A Personal Story - highlighting an everyday hero! 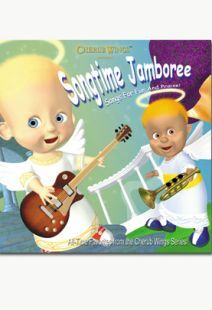 Cherub Wings is a bouncy little emissary sent from above to teach little ones the heavely basics. 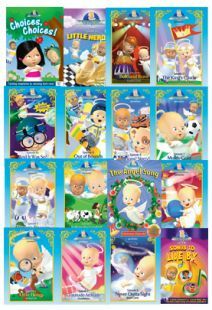 You will find solid content here, including a visualized line-by-line presentation of the Lord's Prayer, a musical production number about the Golden Rule, a contemporary story showing how one little boy can make a difference, a well-chosen biblical parable and a catchy musical finale underscoring the message that God wants us to be happy. 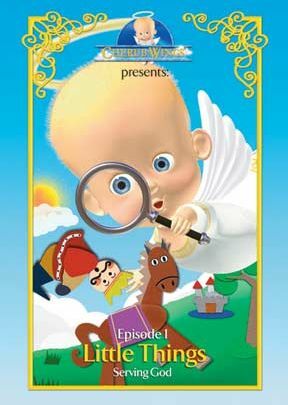 Cherub Wings is the Barney of Christianity. Recommended for very young audiences. I love these DVD's and they have captivated all 3 of my children from infancy. I love the messages they send and my kids love the songs. Best cartoon ever in my book just wish they had more! 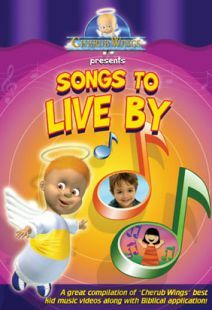 This is a great show that teaches children GOD's word and the truth at an early age. Even I like to watch it with my kids because it helps me have faith like a little one. GOD bless whoever made this and continue blessing them. I recommend this to any child of all ages and not just this episode but all the others as well. If your a parent or grandparent this is a lovely gift for all occasions.